This is the perfect dessert to take to your 4th of July parties or BBQs! 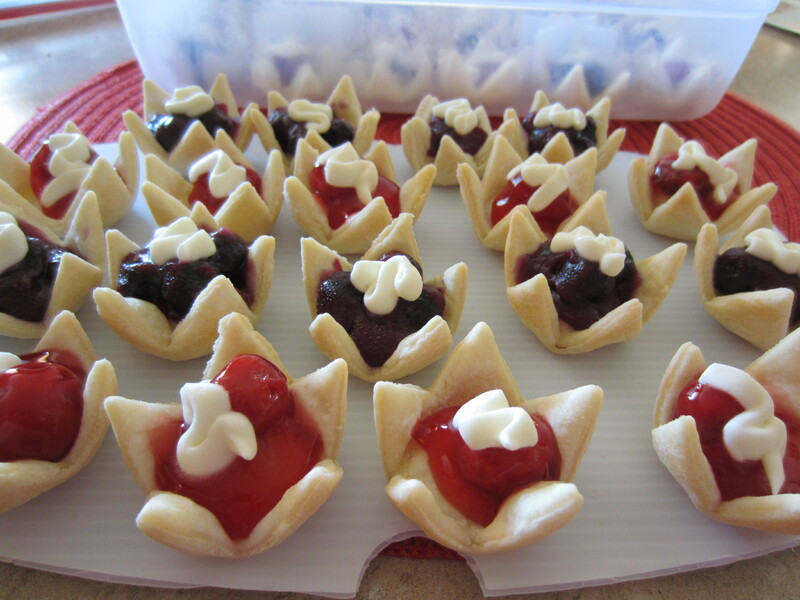 The little tartlets are star-shaped and filled with red cherry filling and blueberry filling. Very patriotic! Sweet Stackers made it easy to store the bite-sized desserts stacked and in one container without messing the tops. They are ready to transport to a party! The tartlets were very easy to put together because they were made from refrigerated pie crust. Preheat the oven to 350º. Rollout the dough. Using a 2.5 inch star cookie cutter, the star-shaped dough pieces were gently pressed into a lightly greased mini-muffin tin and baked for 7-8 minutes. 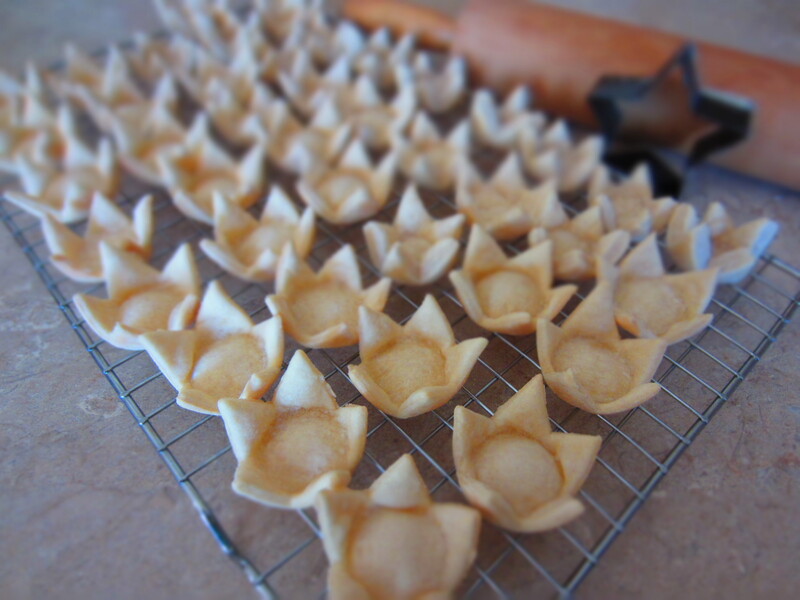 Remove the little tartlet cups to cool. The tartlets can be filled with any flavor pie filling. But, to keep with the patriotic holiday, I wanted to alternate red and blue filling. 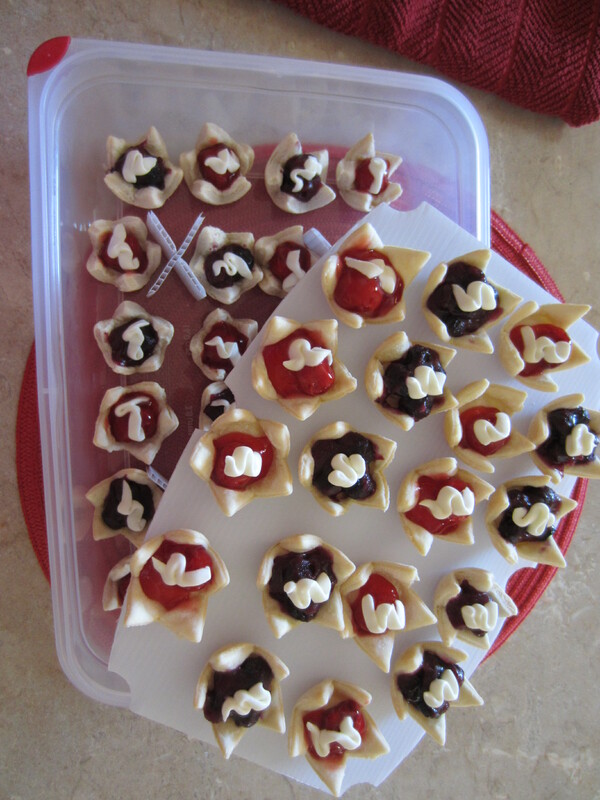 I actually had some cherry pie filling on hand and I filled half of the tartlet cups with a little dollop of cherry. Then I made a batch of homemade blueberry filling. Place all ingredients in a heavy saucepan. Bring to a boil, stirring constantly until thickened. Remove from heat to cool. Once the remaining tartlets were filled, the following cream cheese filling was piped on top. Using an electric mixer, on high, beat the cream cheese and butter until smooth and fluffy. Lower the speed and add vanilla, then gradually add the sugar. Sweet Stackers are a handy way to store bite-sized desserts and cookies in one container to maximize the container space. 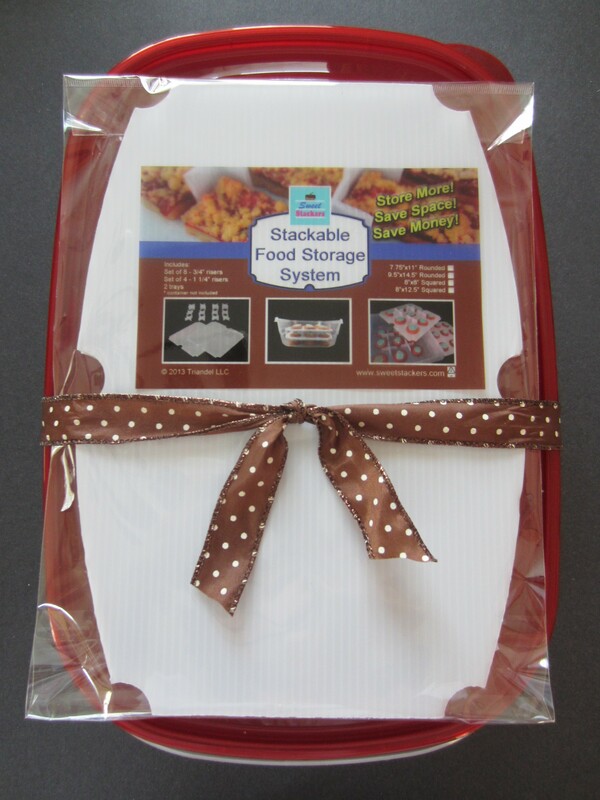 The stackable trays convert your food storage container into multi-level. 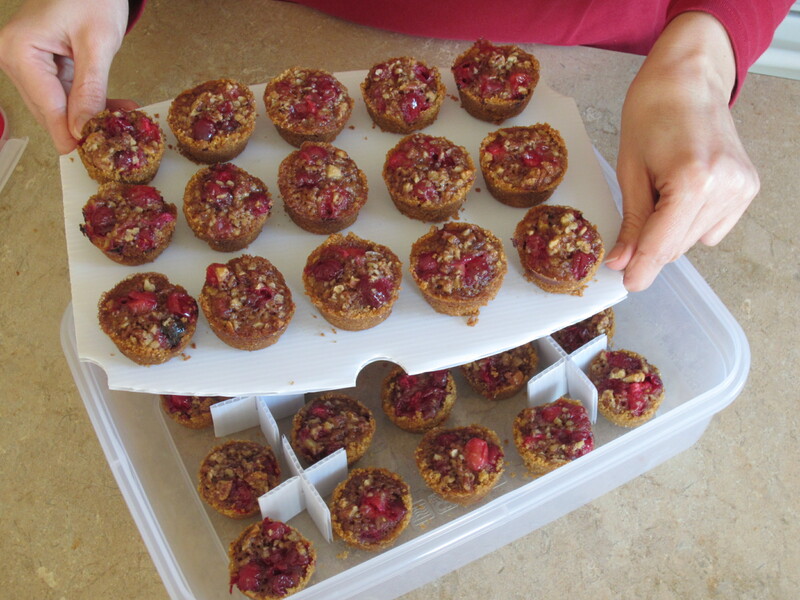 Tartlets fit perfectly in two layers in a 3″ deep container without messing the filling or having them stick together. Visit sweetstackers.com for more details on the product, sizes available and where to purchase them. Great thing is that they are reusable and ready to use for your next summer party! Hope you enjoy the holiday with your family & friends! My niece turned 2 and she was celebrating with a Bubble Guppies tv show theme. 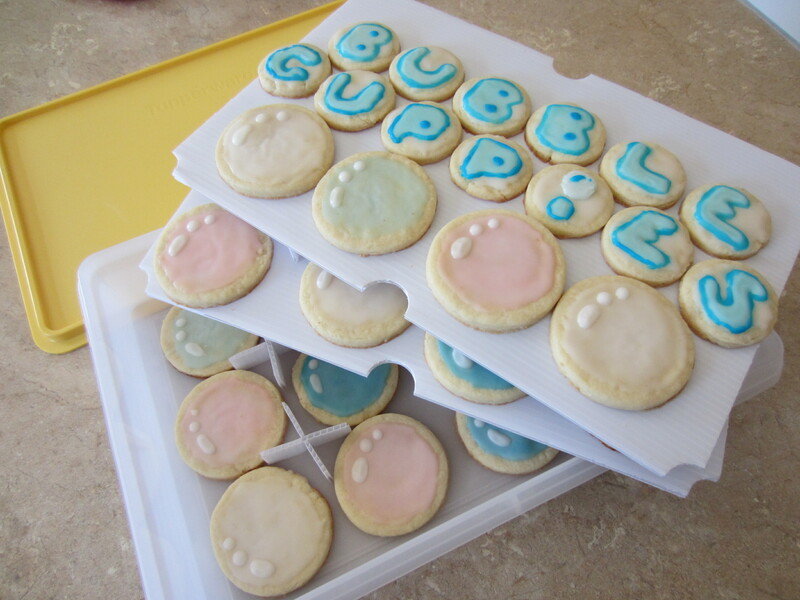 She is already recognizing her letters, so I wanted to make small bubble shaped cookies spelling out “Bubble Guppies”. I thought she would enjoy that. The rest of the cookies were bubbles! 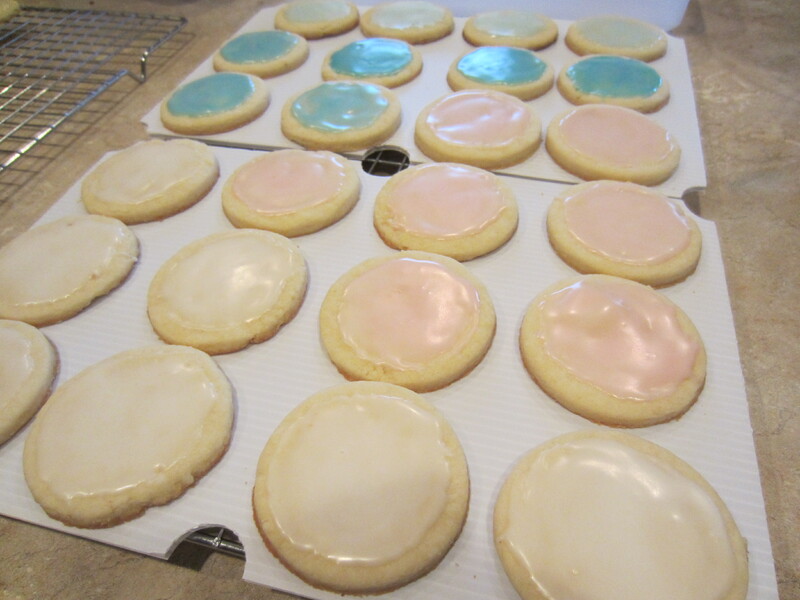 They were glazed with pastel colors pink, blue and white. These would be cute & easy for any spring or summer theme too! …and now for the taste test! My theory was put to the test! During the decorating process, cookies should be stored in an air-tight container to keep them fresh. I have heard many people say that they leave their cookies out of their kitchen counter top to let the cookies dry completely. Hence, my taste test. I reserved a few extra cookies to leave them out to dry overnight. With the large batch of cookies, I followed the instruction below. 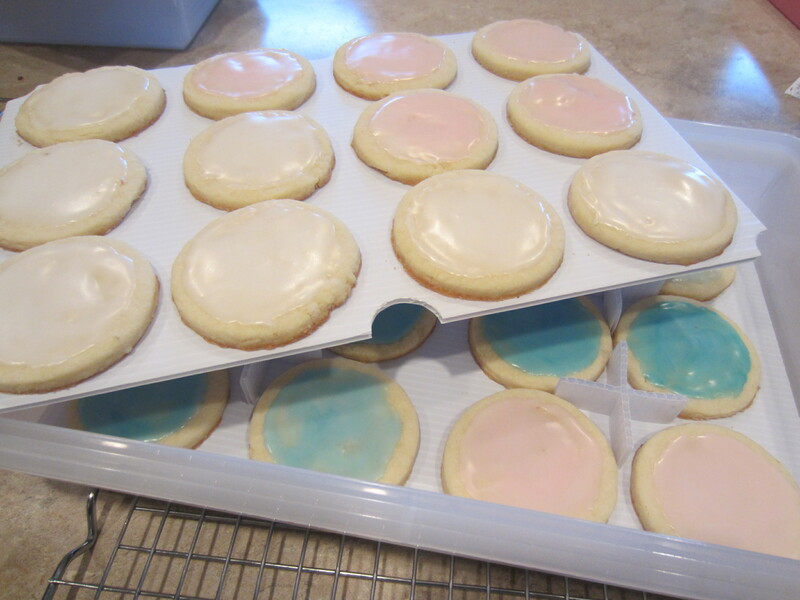 As there is success with safely letting the icing dry, the cookies also dry out during this process. First thing in the morning, I tasted a cookie that sat out all night and a cookie from the container. The overnight cookie had a crunchy texture and a slightly different taste. Definitely not a fresh, soft texture like the one that was stored in the air-tight container! Once the cookies cooled completely after coming out of the oven, they were placed in an air-tight container until I was ready to decorate. During the decorating process, I placed 12 cookies in the bottom of my container and 12 more on each Sweet Stackers tray. I glazed the cookies with a thin layer of icing (mixing 1 cup confectioner’s sugar and 1-2 tablespoons milk). Place the risers carefully in between the cookies and lower each tray into the container. 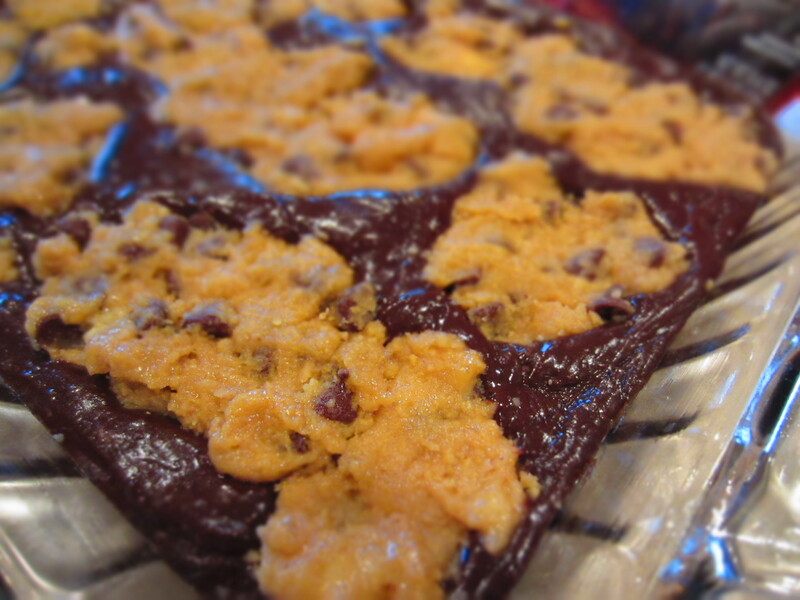 I was able to fit 36 – 2.5″ cookies in one 9×12″ container in three layers without the cookies touching each other. Placed the lid on the container to dry. After drying, I then embellished with a thicker combination of icing. Piped the dots to imitate the reflection of light on each bubble. Then piping the letters in blue. Again, placing the layers of cookies back into the container and sealed to keep them fresh! Sweet Stackers are for more than just cookies! Visit sweetstackers.com to get more ideas on how to use them. The Key to Baking Great Tasting Cookies! The key to making the best rollout cookies is how you store them. Have you ever tasted sugar cookies that are beautifully decorated, but really don’t taste great because they are hard and crunchy? Mostly likely this occurs when the cookies are not stored properly while decorating the cookies. Decorating can be a long tedious process that requires the cookies to sit out and dry to prevent the icing from getting ruined or smudged. Many decorators will leave them dry on their kitchen countertops overnight. Usually this results in dry, crunchy cookies because they weren’t stored in an air-tight container. I have been using the same sugar cookie recipe for years and found Sweet Stackers to be a baker’s best tool for cookie storage. Once the cookies come out of the oven, they are immediately set on a cookie rack to cool. When completely cooled, they can be decorated or stored in an air-tight container until the decorating process begins. While icing the cookies, it is possible to keep the cookies fresh and stored safely in an air-tight container! 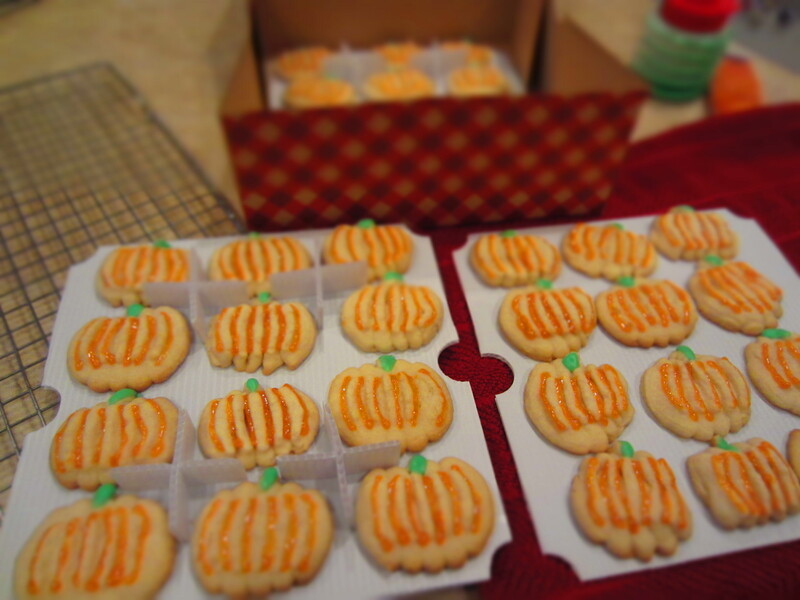 The cookies can be placed in the bottom of a container or on the Sweet Stackers trays as they are being iced. The risers can be carefully positioned in between the cookies and the stackable trays can be lowered above a layer of cookies without touching them. The cookies can finish drying in the air-tight container and this will produce soft, buttery cookies for days to come! Sweet Stackers allowed me to get 36 cookies in a 9 x 12 x 3 inch container without the cookies touching each other and getting smudged. Sweet Stackers come in 4 different sizes made to fit a variety of major brand food storage containers. Great for storing food items like iced or jelly topped cookies, dessert bars, bite-sized appetizers and transporting them to a party without a mess. No need for those over-sized, pricey cupcake and cookie carriers. Sweet Stackers are reusable and versatile – a great food storage tool for any baker! Have to admit that I am a little “cookied out” after Christmas. For New Years, I thought I try a guilt free dessert that would be fun and festive. 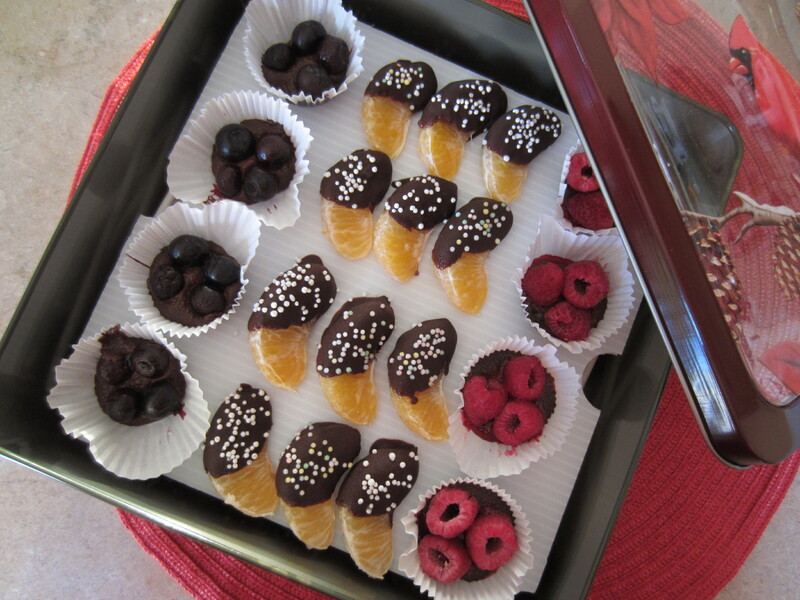 Dark Chocolate Dipped Fruit – chocolate covered blackberry pops, fresh mandarin oranges dipped in chocolate and chocolate berry cups. They will transport easy to a party using Sweet Stackers! Using a double boiler, add half a bag of chocolate chips and one teaspoon of shortening (to make the chocolate smooth and silky). Stir until melted. 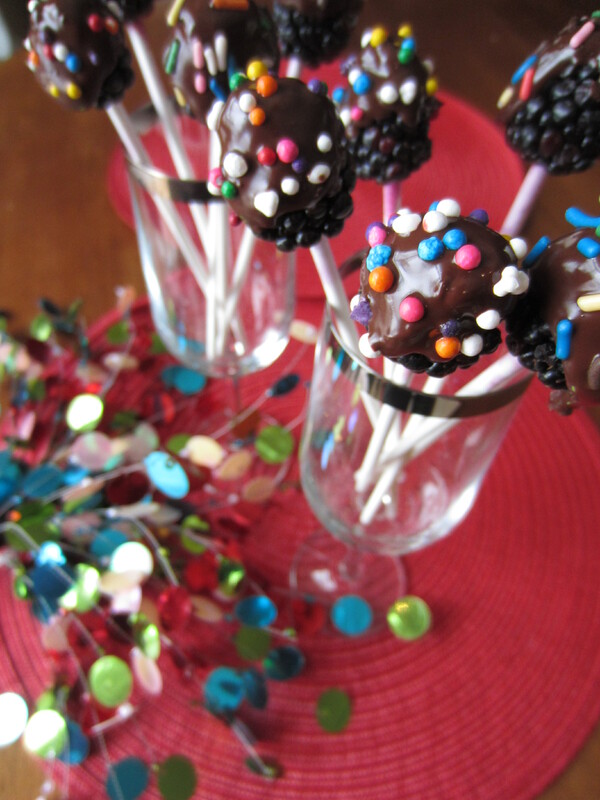 Place blackberries on a pop stick and dip into the melted chocolate. Add festive sprinkles immediately and stand to let cool. Dip the mandarin oranges and place on a sheet of parchment or wax paper, then top with sprinkles. For the berry cups, I added a teaspoon of chocolate into mini paper cupcake liners and place three raspberries and blueberries on top. The berries will set into the chocolate. Refrigerate. Sweet Stackers will divide your chocolate confections without them smudging, sticking or melting together. Ready to transport to a New Years Eve Party! 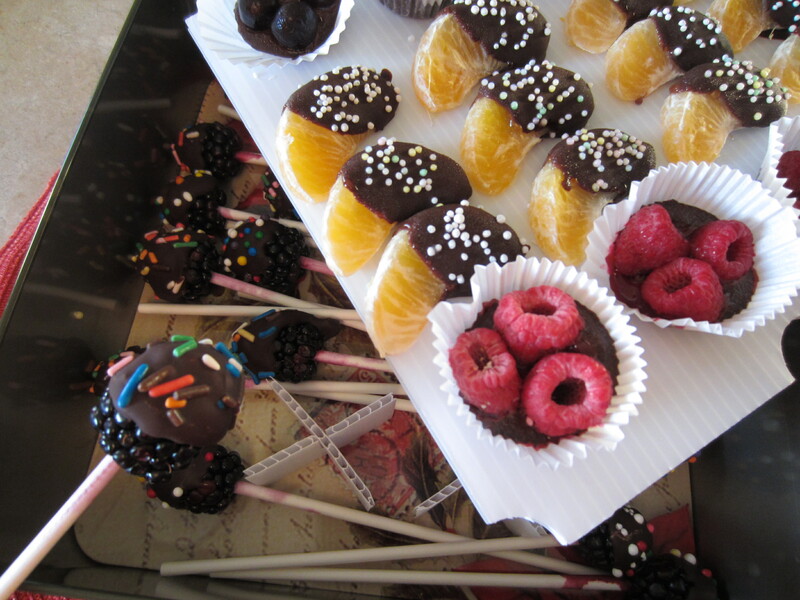 Once you arrive to the party, the chocolate covered fruit pops will display pretty in a few champagne flutes. Wishing you all a Happy and Healthy New Years from my PartyKitchen! Sweet Stackers – Free Shipping Coupon! Christmas cookies can be neatly stored in your container! Sweet Stackers are reusable, stackable trays that separate and protect your sweet treats without them sticking together. 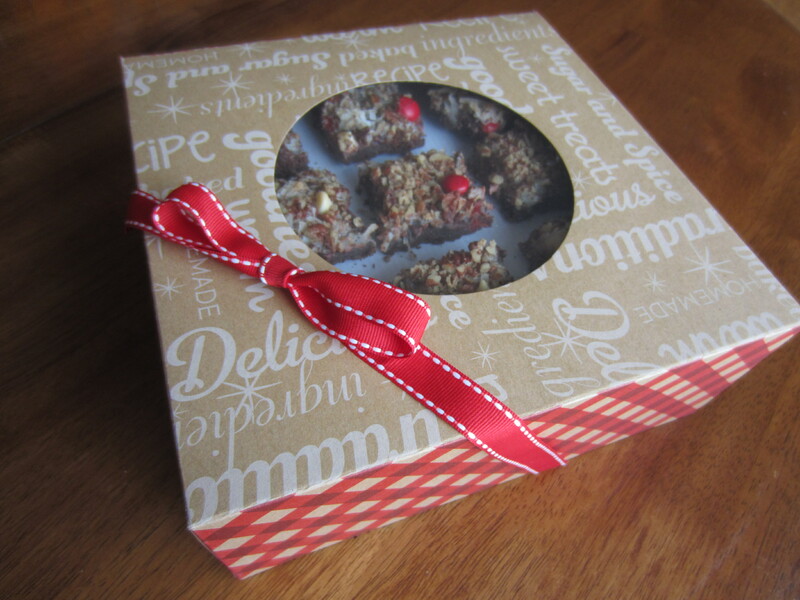 Holiday cookies can be safely stored in multiple layers. They are ideal for cookies that have a jelly filling on top or icing that you don’t want smudged. Not only will they help you neatly store desserts in your container, they can also separate the sweet treats that you are giving as gifts. Mix and match your treats without a sticky mess; cookies on one layer, brittle or bark on a different layer and chocolates or truffles on another layer. Free Shipping on Orders Over $20 now through 12/31/2013! Enter coupon code FREESHIP20. 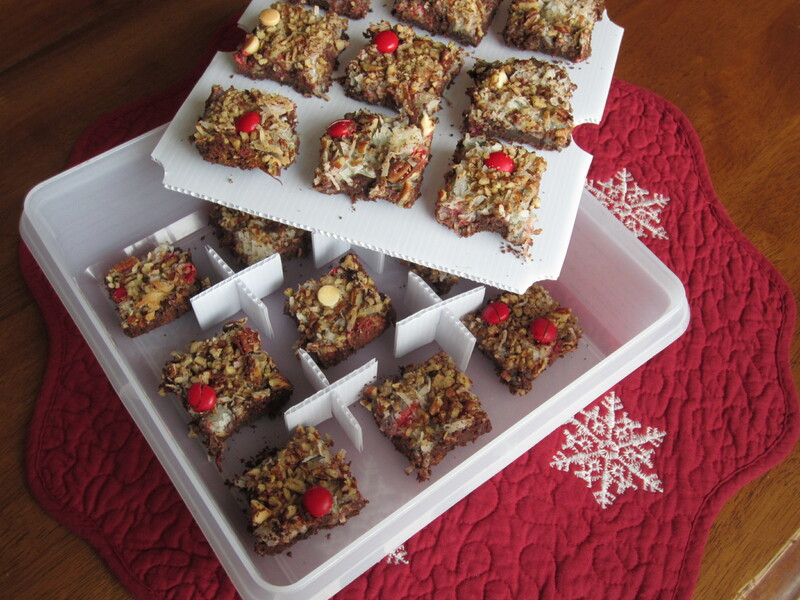 Try Sweet Stackers for your holiday baking and don’t forget that they make great gifts too! Yes, I had a late night craving. Then I remembered that I have a secret stash of something sweet in my freezer! Thawing is much faster than baking a whole batch of brownies or cookies and I am not really up for baking at this time of night, plus the aroma would probably wake up the kids. My SweetStackers Stackable Food Storage System really did the trick! 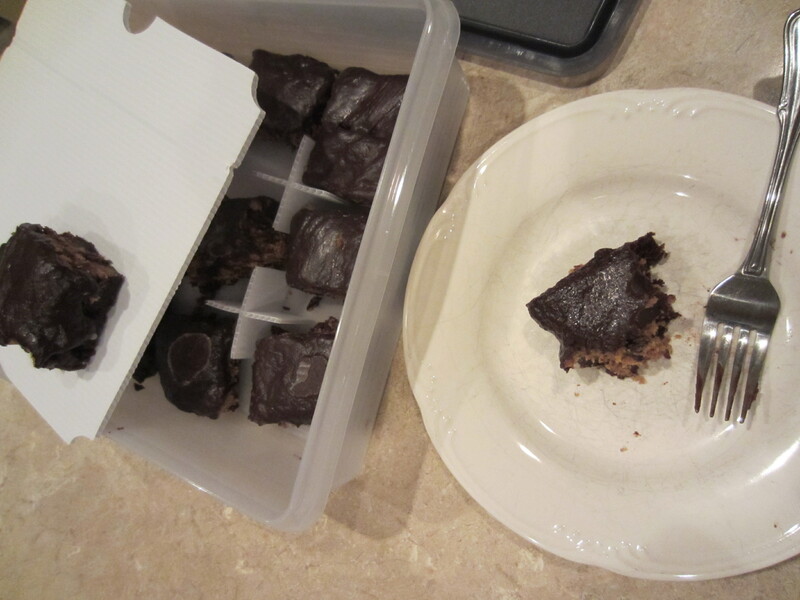 They separated and stacked the remaining brownies that I made a while ago in a small 9×9 Tupperware container, perfect for the freezer. Pull out one brownie (or all of them) when you have a craving. 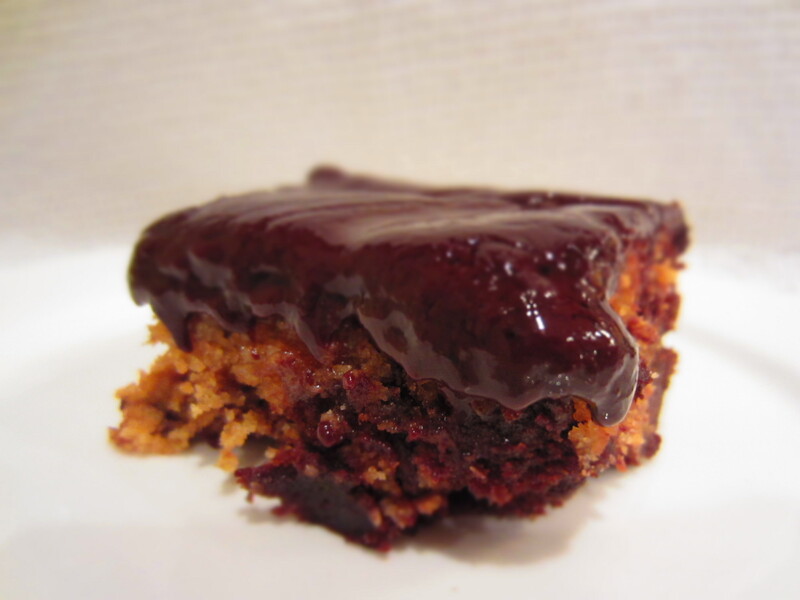 Check out my original post on how I made these brownies, they are decadent! Love this recipe! 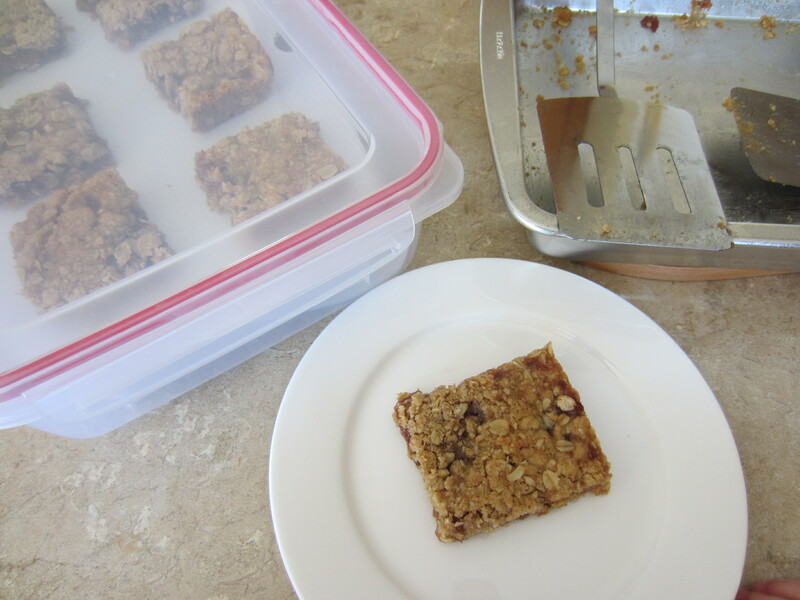 So easy, so yummy…and perfect for a play date. I am pretty sure the kids liked it and I know the Mommies sure did! Thank you Pioneer Woman for a great recipe. 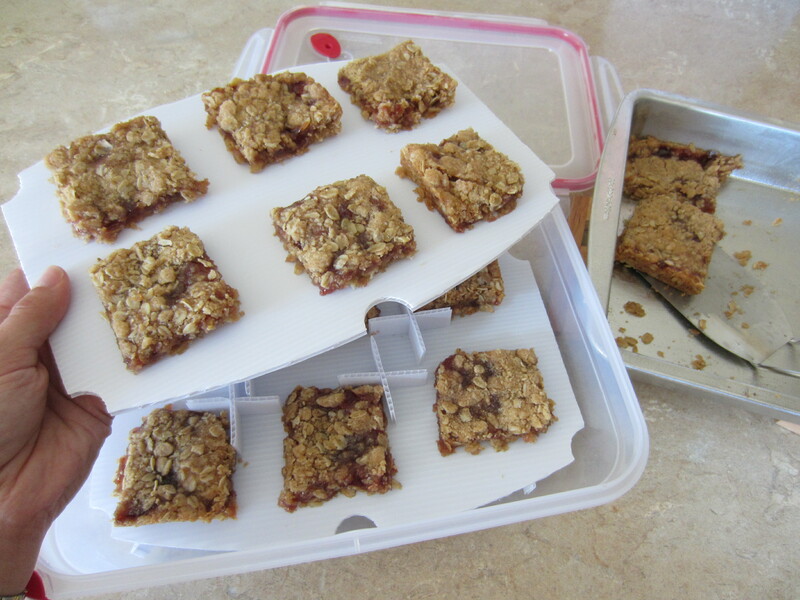 This recipe intrigued me because the filling can changed to any fruity jam or preserves. So depending on your mood or whatever jar of jam you have in your pantry, you most likely have all of the ingredients on hand. Though…it sounds like the strawberry is the best if you need a comfort food. 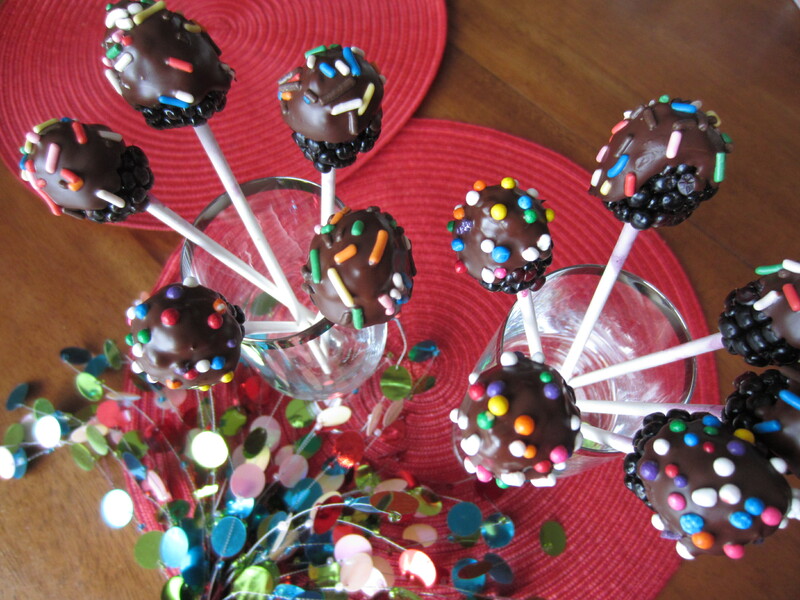 They were hard to only eat one….perfectly sweet! Preheat oven to 350°. Grease a 9 x 13 inch pan. Add the flour, oats, brown sugar, baking powder and salt to a large mixing bowl. Cut in the butter (using your hands, combine the butter into the dry ingredients) until it makes course crumbs. Spread half of the mixture into the greased pan, pushing it evenly and tightly into the corners. Add a layer of the jam over the oatmeal crumble, carefully spreading it with a knife. 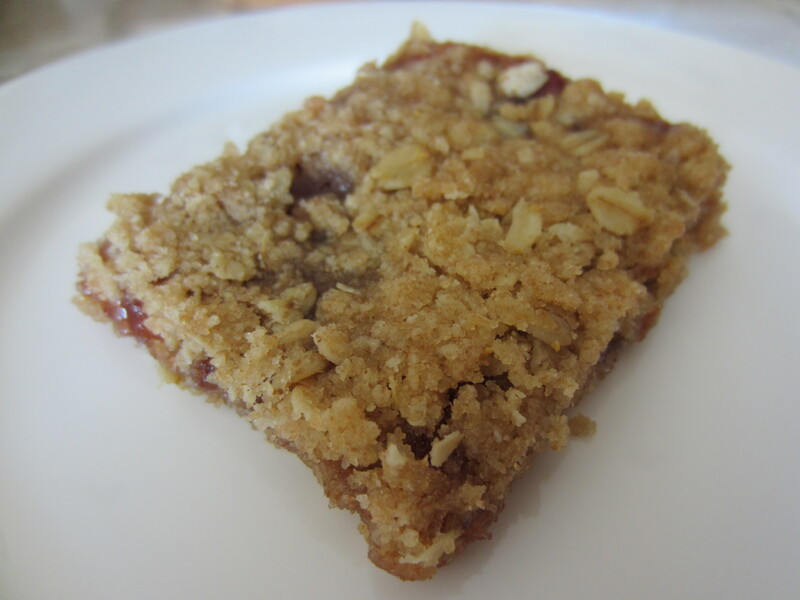 Then layer the remaining oatmeal crumble over the top of the jam. Bake for 30 – 40 minutes until the top is golden brown. Now for the hard part. Cool completely before cutting into squares.